Lucille’s Mountain Top Inn & Spa is a spectacular setting for weddings. The inn’s lush green lawn and decks are the perfect location for your outdoor event, with the Blue Ridge Mountains providing a picturesque backdrop. The Dining Room and Living Room, with their large banks of windows and mountain views, also offer exceptional settings for small weddings and intimate elopement ceremonies…but to protect the experience for all of our guests, we have decided to offer only 2 “sizes” of weddings: elopements (2-4 people, including the couple) OR larger full-house rental weddings for up to 30 guests. 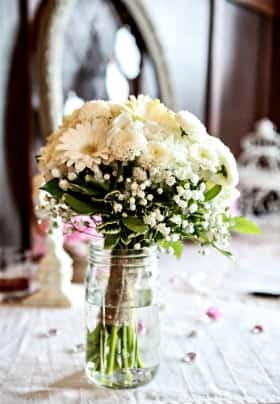 This also means that we are not able to offer “venue-only” weddings – wedding services are only available in conjunction with room rentals at the Inn, which are NOT included in the package pricing. If your ceremony doesn’t fit either of those scenarios, we will be happy to provide lodging for the couple and as many of your guests as we can accommodate in our 13 guest rooms, along with spa treatments at our day spa. We’ll also be happy to connect you with our neighbors who can provide you with everything else you might need, from a venue, to a cake, photographer, and other services…but we don’t want to make any of our other guests (or yours!) feel like wedding crashers – so we aren’t able to host ceremonies or receptions that are outside our specialty areas. Also, because weddings are such special events, we really want to be able to focus our attention on them! We feel that it’s impossible for us to provide the best possible service when we’re in the middle of our peak season, so we are unable to offer elopements between mid-September and mid-November (exact dates may vary), since it is by far our busiest time of the year, and we never do them on Fridays, because that’s generally our busiest day of the week. Call us to arrange your private wedding tour of our facilities and to meet with our Event Coordinator to discuss your big day. Wedding photographs on this page are courtesy of Michael Grafx Photography and Joyelan Photography, our preferred providers. Please call us at (706) 878-5055 to schedule an appointment. * Please Note: We are a small customer-focused business. To provide the utmost service for current guests and potential wedding clients WE ARE UNABLE TO ACCOMMODATE UNSCHEDULED OR DROP-IN VISITS to preview the facility. Please call us in advance to arrange your special time to visit and discuss your event. 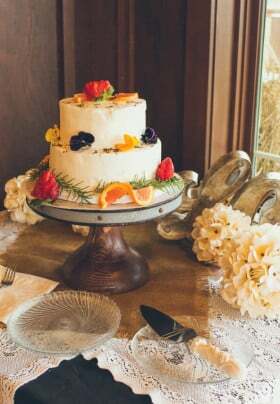 Lucille’s Mountain Top Inn & Spa offers elegant intimate elopements and weddings that help you celebrate your special day with a stylish ceremony in a beautiful and relaxed setting. 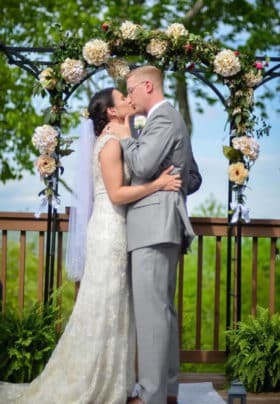 Our Wedding and Elopement packages provide a beautiful ceremony at a price difficult to match if you were purchasing the services individually for a custom wedding. With a single call to our inn, we can help you plan a beautiful ceremony and a romantic getaway that you will cherish forever. We would also love to have you and your guests stay with us before and/or after the ceremony as well – please note the additional room rental requirements below. To enhance your intimate wedding a variety of additional services are also available, such as a professional photography, additional flowers, and a variety of spa packages for the bride, groom or wedding party to enjoy during their stay. Base pricing is provided below, or feel free to give us a call to discuss the possibilities and to request quotes for add-ons you would like to consider. Our Wedding Packages deliver a memorable, elegant ceremony for the bride, groom, and their guests, all at a great value and with a personal touch. Please note that our wedding packages do NOT include room rentals…regular room rates and minimum stays apply except as noted below. Intimate Elopements are not available on Fridays or any time during our peak season (typically 9/15 – 11/15) – Friday ceremonies always require full Inn rental. *Price does not include taxes or requested 18% staff gratuity. Does NOT include lodging. 2-Night required room rental for Couple with 10% discount*, plus all 12 additional rooms at prevailing rack rates. Friday/Saturday Weddings require full Inn Rental for 2 nights – also requires $1500 Spa minimum. For 3-day holiday weekends, must rent all 3 nights (Friday-Sunday), even if the wedding is on Sunday – also requires $1500 Spa minimum. Full Inn weddings will be offered during peak season (typically 9/15 – 11/15), but require 2 night minimum. Additional Staffed Reception/Event Time – minimum $250 upcharge (only available with full-house rental)…note this option also requires a $1500 damage deposit, which is refundable if no damage occurs.